It all began with working on the Lyne Water in the Borders. One or two of the springs that feed into it have a lot of associated local folklore, which I realised ties into world folklore about wells and springs. I remember hanging over the edge of a well where one of the Lyne Water springs flowed out and noticing it had a very characteristic voice – almost like a speaking or chattering voice. I began to wonder, what if every pure source of water, like a spring or a well, has a different sound. How interesting that would be from the point of view of poetry and creating words, where poets get their words or sounds. Was it the case that every spring is different, just as every poet is different? That was what inspired me to start going to different springs, listening to them and recording their sounds, photographing them, drawing them in my notebook. I wanted to travel to them, find out what they’re like today, find out if people still visit them and what they have to say about them. I set out on my first field trip with a little recording machine and a tiny camera, the smallest I could get. I was on tenterhooks until I could establish that there was a difference in ‘voice’ between one spring and another – I could have been wrong, water pressure might have been fairly similar everywhere. I felt pure joy when I played back my recording of the second spring I visited and it sounded dark and slightly sinister compared to the more cheerful, chattering one that I’d heard first. Since then I must have visited 120 springs and wells and they are each totally different. In The Spring Teller, is the teller the voice of the well? The title has a couple of meanings embedded. 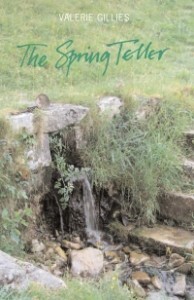 A spring teller is a diviner, someone skilled in finding where water is, usually by dowsing. The word ‘teller’ contains the feeling of telling the story, communicating the rhythm and the individual voice of each spring. At the outset I knew that these poems would all be different rhythmically; it was almost as if the springs themselves were suggesting a whole new idea of poetics or metrics. Divining. What on earth do you think is happening there? I don’t know. I just know that it works. On my field trips I’ve always got a pair of divining rods with me. Some of the springs are very overgrown, you need to be prepared to search for them. I was taught to use divining rods by a friend who’d spent years putting up fences in the Borders and used divining rods to find the best place to put a fence stob. He taught me in a very practical way how to use them. Anyone can do it, the rods are like an extension of our own arms and hands. I’ve heard that diviners can even tell quantities and depths of water. Yes, they will ask their rods, how many metres down? Something in us knows it, but it’s difficult to get it spot on unless you have the rods. Very curious. The idea of ‘healing wells’ is regarded as a bit esoteric. But I once read that monkeys in the wild use particular plants for curative purposes, and that really makes me wonder how they work that out. It makes me think that deep inside all of us is an inherent understanding of the properties of the natural world and that science is a way of drawing out that innate knowledge. Traditional methods of determining the curative powers of particular springs were quite scientific. Any water coming from the water table through the rocks in different locations is going to contain different chemicals. People experimented with different waters to discover which worked for what – for instance, water containing iron could be a curative for people with anaemia. A condition called ‘dry eye’ used to be very prevalent in Scotland in the days when people sat around the fire at home being kippered by the smoke, and the application of water from certain wells was known to relieve that irritation. Interestingly, I met an American eye surgeon on one of my Highland trips who told me that an ingredient used to treat dry eye symptoms associated with modern air conditioning and central heating contains one of the chemicals found in water from these ancient ‘eye wells’. In the past, people who couldn’t afford medicine used these wells: the healing wells were the doctors of the poor. The Victorians were very interested in taking a scientific approach to the power of water. The British Geological Survey analysed samples and recorded the chemical traces they found (although the constituent elements can be expected to have changed somewhat by now). There was also strong interest in the architecture of old canopies, or well-houses. I looked at some wonderful Victorian drawings of medieval well-houses before visiting them, often to find them looking a bit more battered. I like to get a sense of the history: which wells were famous, which were travelled to. I would go to wells that had been renowned in the past, wondering if anybody still visited them, or if they still existed. I have Ordnance Survey Explorer Maps for Scotland which give the names of springs in blue if they still have water, or in black gothic if they’re dry. Sometimes the springs have broken up down the hillside, sometimes they’ve moved – springs can get offended and move! Like in folklore, you know, if you say rude things to them, they dry up! But then they appear somewhere else. Did you find it surprising how many people still visit these wells? Wells are still fairly sociable places and yes, it’s surprising how many people go to them and take away bottles of the water. I love some of the recordings I have of wells where you can hear people laughing and chatting in the background. Did you actually get down to writing while you were at the wells -­ did ideas float to the surface of your mind there? Yes, and I was always writing or sketching in my notebook. I have built up quite an archive of the sounds from the wells, and hundreds of photographs, some of which appear in The Spring Teller. These are places that people have regarded with awe for hundreds of years – this pure, fresh water will once have been rain that seeped through to the water table long ago and reappeared, purified as it’s come up through the rocks, so you could be drinking rain that fell a hundred years ago, and so on, back through the water cycle.